Awesome work so far Nigel. I am not normally into softskins but seeing your work on this is giving me the urge to try this one! Been playing with some paint now guys.. still waiting for the Mig ammo desert yellow RAL8020.. 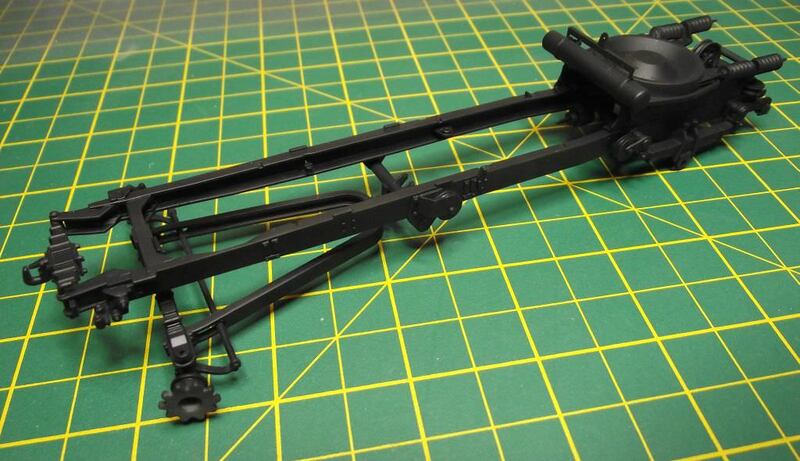 I gave the chassis and odds and ends a coat of Alclad black primer filler.. I was hoping this would show up any imperfections, mould seams or gaps.. but no it all looks good initially, until I added some desert sand colour I remember I mixed up for my Matilda. Man, those imperfections pop now!! If you've been thinking of getting this kit, I think these next three pics might make your mind up for you? Its some of the best detail I've ever seen on a £50 kit!! 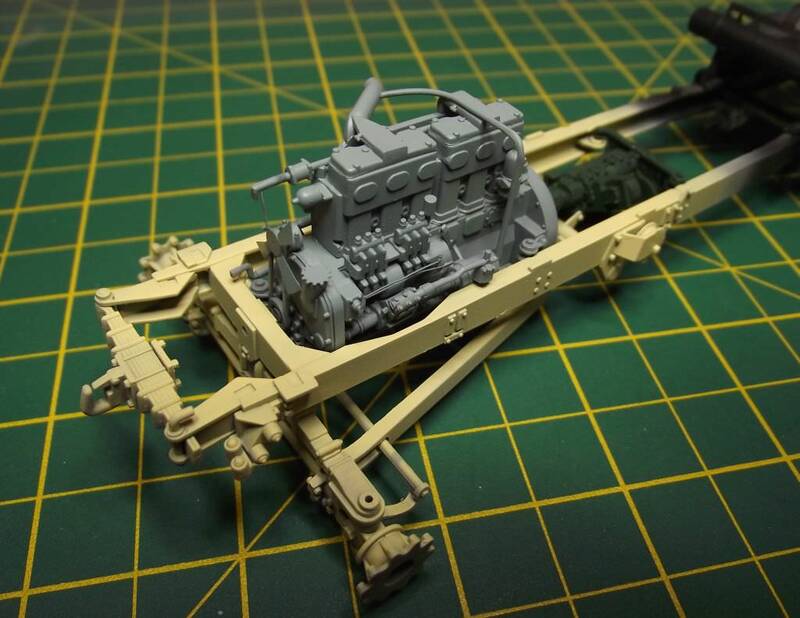 Engine is Gunze RLM 65, transmission is Tamiya XF26 deep green. The rear end is just as busy.. Isn't it amazing what a little colour can do for a model. Just think how much better it's gonna look with washes and weathering!! Actually, no he didnt.. I posted pics of my modded axle on november 25th, Terry waited until December 5th. so.. I WIN!!! If you don't already have this kit, get it.. it's brilliant!! I have the LZ models resin wheel sets for both the tractor and trailer (firestone) and the tread pattern is the same on both! ?, I'm confused. I've decided to resurect this fom the drawer as I just NEED to see it finished!! 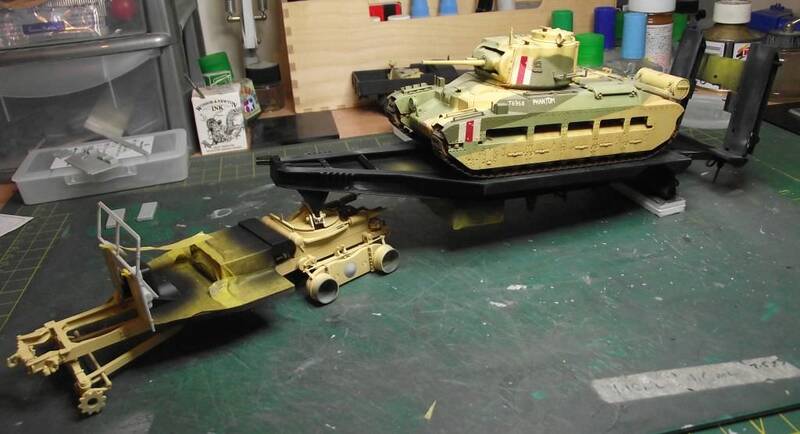 I have decided to go for the Mickey Mouse scheme as supplied in the kit and am wondering if its feasible that the Army would have brought a desert vehicle back to europe and repainted it, ie would it be accurate if I chipped it? Beautiful job Nige - I've got the recovery truck on pre order . Go for the new mickey mouse camouflage! Thanks Christophe.. that's just what I am doing!! So, here's the chassis after stripping in Dettol and drying out for three days. It has a black base primer once again. The cab looks so much better in OD don't you think? I really want to leave the wood floor exposed, but I know it's not accurate? What do you think? I even did a woodgrain effect underneath and on the backs of the crew seats. I will probably do the hairspray technique and rub away the OD where the feet would have been? Just a little mock up pic.. I'd just like to finish by saying how much better spraying with tamiya thinned with Gunze is than the horrible Ammo Mig paint. I really cant get on with these polyeurethane acrylics that everyone raves about. Great to see this back on the bench Nige. That woodgrain effect is fabulous. It really wood (pun intended) be a shame to cover it up. I have some Mig paint that I used on a Ford GPA. I bought it as lightened Tamiya OD is just terrible these days. You really do have to apply them in thin coats and allow it to dry between them to get the right result. And you need to clean the tip regularly, so it is time consuming. 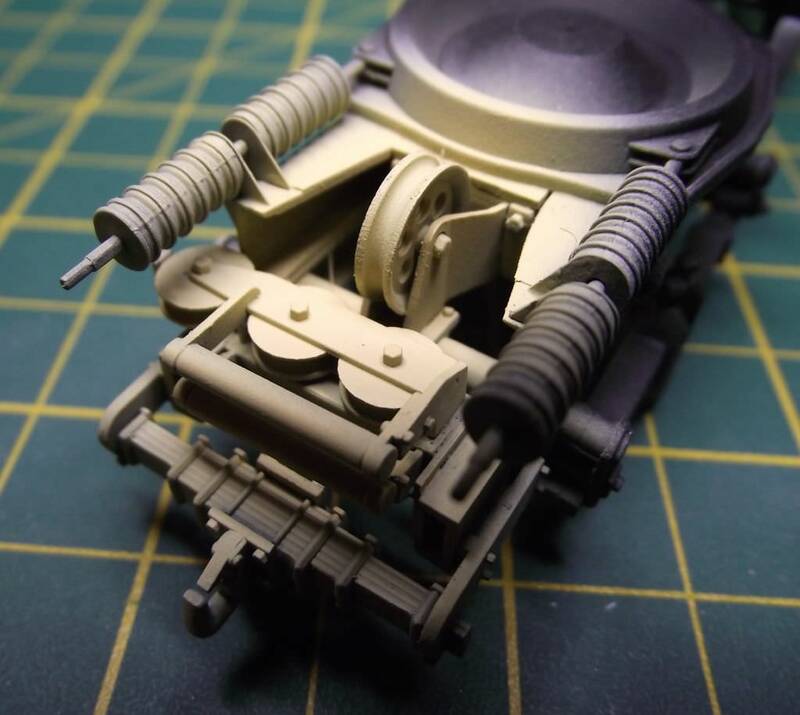 It is a whole mindset shift from Tamiya application, and in the end, it all comes down to what gives you what you want. I do not see myself moving too far from Tamiya either, but nothing ventured nothing gained. I've been off this one for a couple of days now as I have been waiting for some little extras to arrive from LZ models. First on the list is the upgraded basket, which replaces the kits PE basket with a slightly more advanced PE basket. If you get the Thunder Models SV/2S you get this upgraded PE in the box. This set costs just over £5. The new basket is made up from 10 pieces of PE and includes a thicker copper fret for the front webbing and additional parts to make the basket more accurate. These extras include the front support rod, underside framework, correct front clamps and a more to scale finish on the front and rear panels. Here's the set.. with the stock kit part behind it. You can clearly see this will add to the overall appearance of the model.. I'll build mine in the next day or two and put up some side by side pics for comparison. And finally, a close up of the frets. Again, please note this upgrade is only applicable to the Transporter and the R100.. the SV/2S comes with this upgrade already. 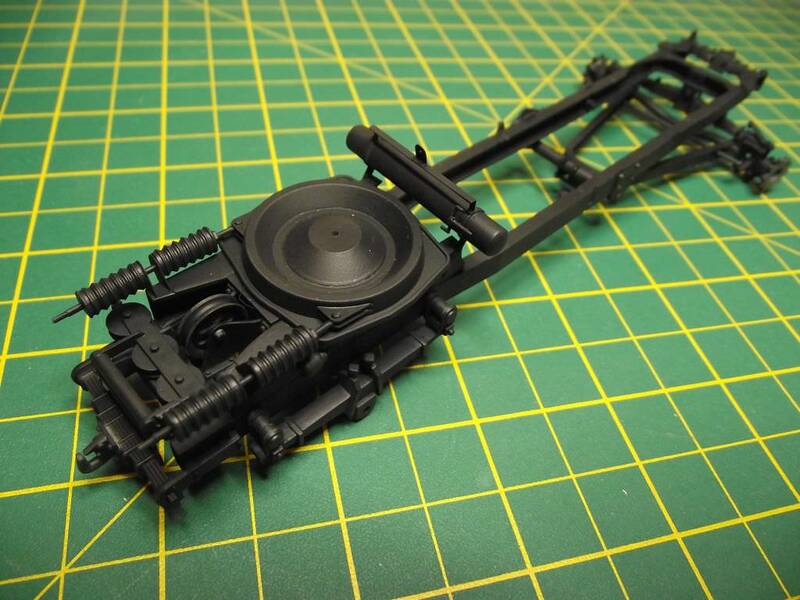 LZ models makes resin wheels and tyres for all the Scammell kits and for the Transporter trailer they do sand patterns as well as the normal dirt tyres. I have gone for the "Cross Country" tyres. Remember, the rear wheels and tyres for the Tractor unit are bigger than all other tyres. On initial inspection the tyres look cleanly moulded with minimum clean up required. They have made my front wheels in white, whether this is to identify them for me or for packaging purposes I don't know, but I guess it's done for a reason? I was never happy with the kits tread pattern, although it has been pointed out that a similar tread pattern does exist on page one of this very thread. Here are the plastic and resin wheels together so you can decide which you think is better.. plastic is on the right. Even if you decide the plastic tyres are good enough, you still have the advantage of having plastic tyres. Yippee!! Not the usual horrible vinyl things in most kits these days!! So, there we have it.. these are all the updates on this kit for now. 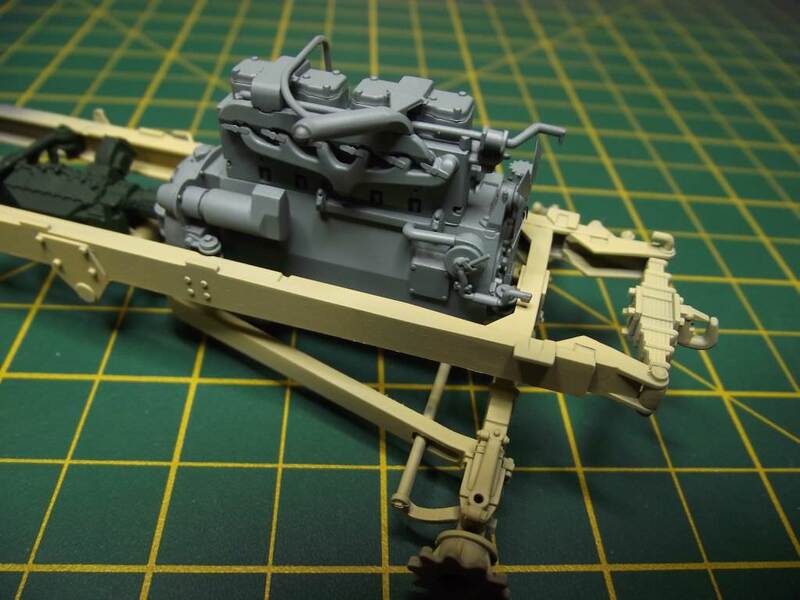 I think I'm gonna get stuck into my Scammell double build and catch up with this one to make a triple build? The resin tyres do look better. No doubt about it for me at least.